A Borboleta Caveira, uma espécie de grande envergadura (90-130mm), é facilmente reconhecida pelo padrão em forma de caveira presente no seu tórax. A borboleta emite um som alto quando se sente ameaçada. O som é produzido pela expulsão do ar pela espirotrompa. É comum a borboleta ser observada em colméias durante a noite. Ao contrário das outras espécies, só ataca colónias da abelha Apis mellifera. A Borboleta Caveira é atacada por abelhas guarda na entrada, mas a cutícula espessa e a resistência ao veneno permite a sua entrada da colmeia. Acherontia atropos is the most widely-known of the three species of Death's-head Hawkmoth. This moth is easily distinguishable from others in this region by a vaguely skull-shaped pattern on its thorax. A. atropos is also very large, with a wingspan of 90–130mm. This moth has the ability to emit a loud squeak if irritated. The sound is produced by expelling air from its proboscis. It often accompanies this sound with flashing its brightly marked abdomen in a further attempt to deter its predators. It is commonly observed raiding beehives for honey at night. Unlike the other species of Acherontia, it only attacks colonies of the well-known Western honey bee, Apis mellifera. It is attacked by guard bees at the entrance, but the thick cuticle and resistance to venom allow it to enter the hive. It is able to move about in hives unmolested because it mimics the scent of the bees. 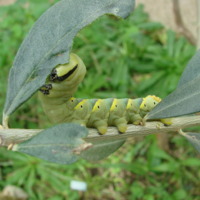 Adriana Galveias (fotógrafo), “Lagarta da Borboleta Caveira,” MUHNAC Digital, accessed April 19, 2019, http://digital.museus.ul.pt/items/show/157.